under 10% at 20 mph, to over 50% at 30 mph, to over 80% at 40 mph. The double-threat is something I’m sure we’ve all experienced, where a crosswalk crosses two lanes in the same direction, the car in one lane stops, while the car in the second lane can’t see the pedestrian for whom the stop is being made, posits that they are stopping for no reason, and goes around them, hitting the pedestrian in the process. This is a big step forward for this intersection. Not Done. The reconfiguration at this location is not yet done. 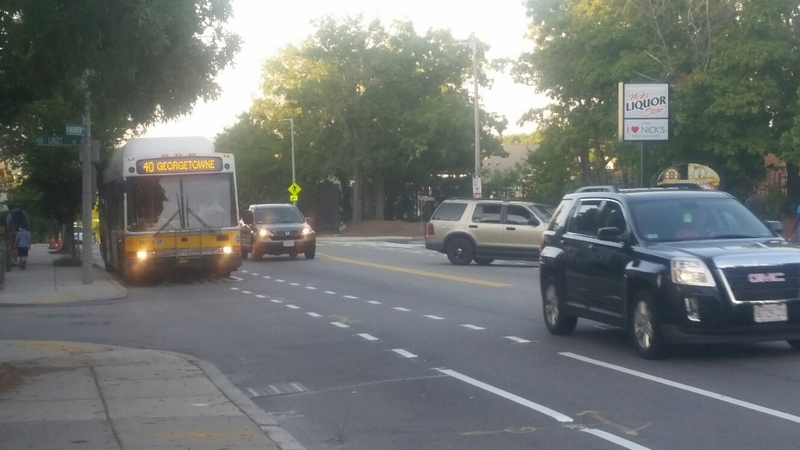 Boston PWD’s contractor should soon be installing (a) flex posts and bollards to delineate both the painted bump out on the southbound side and the pedestrian median, and (b) a push-button activated flashing beacon signal for the new crosswalk. 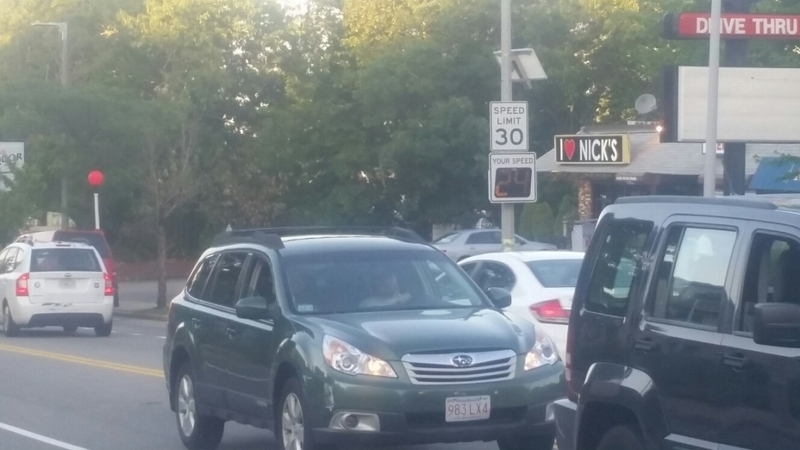 Those of us who are focused on improving pedestrian and bicyclist safety in our neighborhood are intensely interested in this intersection and will be watching closely in the next few days to make sure these final actions are taken as soon as possible. Not Adjusted to Overnight. 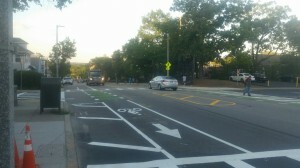 Observations have been made that the new configuration has not yet taken hold and some drivers are still using the new bike lane as if it remains a motor vehicle lane. While unfortunate, this is not surprising. 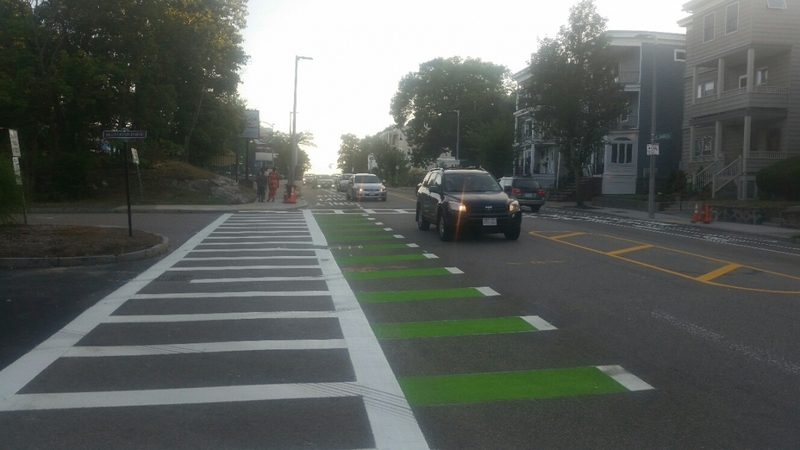 The installation isn’t done yet, and the experience around town is that getting drivers to comply with new roadway configurations takes time and patience. 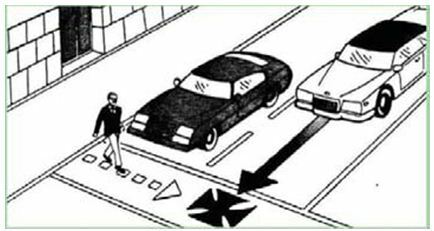 If vehicle speeds are slowing as drivers adjust, see point 1, above. 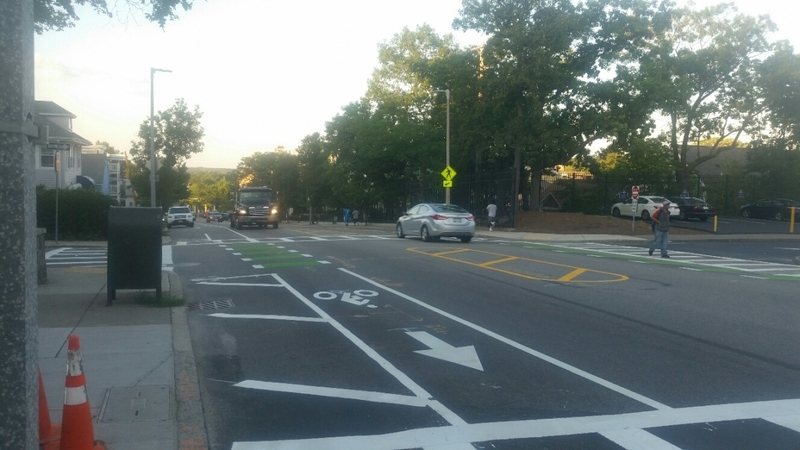 The intent is that the new configuration will reduce vehicle speeds permanently by narrowing the travel lanes and improving pedestrian and bicyclist safety. We last reported on this important location a couple of weeks ago, when construction notices went up and we were eager to see the thoughtful plan that BTD had prepared become a reality. Now, as we hit 210 days and counting, we are still at the stage where nothing has happened within the street to physically address the crash that killed one of our neighbors. As you can see from the photo, the last two weeks brought wheelchair-accessible ramps at 2 corners where a new crosswalk is to go, and bases for the poles that will hold the crosswalk flashing beacon equipment. All of the construction signs and cones/barrels have been moved out and we are again wondering exactly how much longer this will have to wait. I asked this question of PWD on Friday via Twitter, and informed that their contractor “is scheduling remaining work” and they will “update when the schedule is available.” I think we can all agree that we hope the work is done very, very soon – in other words, in a matter of days. We are now well over six months since this tragedy occurred, and this response has been painfully slow in arriving.